Bruce Lee Wallpapers are pretty cool, and not only that, but they perhaps give an indication of where I was going and what I wanted to achieve with the yearlong experiment that was Project Dragon. 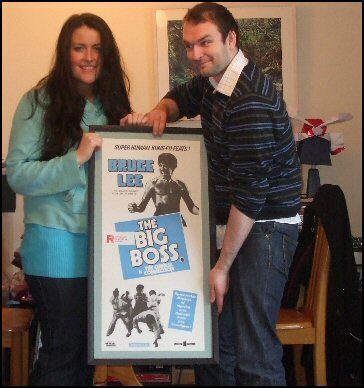 Yep, that folks is a very rare limited original European poster for Bruce Lee’s first solo big screen adventure, the Big Boss, also known over States side as The Chinese Connection. A instant classic, this was the very first Bruce Lee movie I saw way back in my youth and it would unknowingly inspire me to great accomplishments and give me a concrete direction to my life. I’m a big believer in mental training and focus, as was Bruce, and part of the strategies I’ll share in Project Dragon involve keeping your goals foremost in your mind. While I can’t reveal exactly what Project Dragon is about just yet, I can tell that this beautiful caring gift will help me keep my goal in focus and I’m putting it up in my bedroom this weekend, so that it is a starting image to my day. Bruce Lee Wallpapers have also been very useful for me, and I have them on both of my laptops and they been there for the year of Project Dragon too. Can you think why that might be important? What inspires you? Leave me your comments below and if you know of any great resources for Bruce Lee, let me know that too! I’ll have more updates on what I’ve been doing for the last year soon, so stay tuned! Have You been inspired by Bruce Lee Like I Have? Bruce Lee was a huge inspiration of mine, and to many more kids and athletes today. Isometrics were a core part of his training program and helped him build one of the most inspiring, functional physiques of our age. You’ve been reading Bruce Lee Wallpapers. You can read other peoples comments about this article above, or check out my other Bruce Lee articles here.